Doctor Who: RED CHRISTMAS Review | Warped Factor - Words in the Key of Geek. 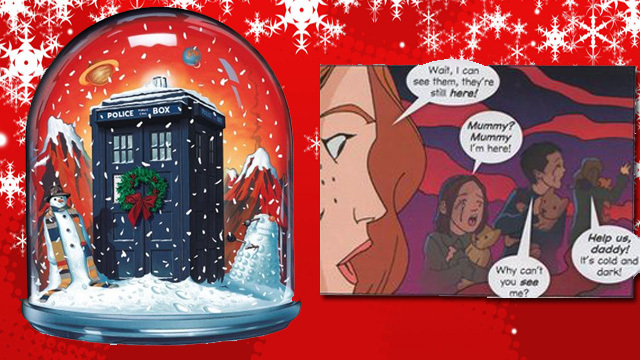 Andrew East looks back at the Doctor Who Adventures comic strip, Red Christmas. Doctor Who Adventures comic strips are a strange beast. The stories they have told, often in 4 pages of frames, are incredibly simplistic. Their format tends to be: the Doctor and companion(s) arrive in setting; a strange event is taking place; it is revealed to be because of an alien; the Doctor dispenses with the alien in a cursory manner and the Doctor and companion(s) go on their way. To be fair, this is the basic format of any Doctor Who story, but the brevity of DWA’s comic strip adventures means that there is very little in between. Other characters are thinly sketched in, the alien is usually a one-note weirdo who roars and then falls foul of the Doctor’s intelligence and the impact of the adventure is minimal on all involved. One other thing a lot of these strips have in common is an obscure historical setting. We’ve had Babylon, Ancient China, the English Civil War and 18th century England. Red Christmas finds us in the village of Hollograd in 1873. As far as I can ascertain, Hollograd is not a real place (correct me if I am wrong, please) but the link with the story’s alien antagonist: the Krampus, places the village in the Alps as the Krampus is an Alpine Christmas legend. The Eleventh Doctor and Amy arrive in Hollograd expecting a traditional Christmas snowy scene. What they find is a red mist covering the village and wailing villagers. The adults are distraught because all of the children have gone missing. The Doctor tells Amy to look closer and they realise the children are still there but that the red mist is being used to obscure them from the parents’ minds and cause grief and sadness. The red mist is a product of the Krampus, an alien that feeds of fear and sadness. Light from the Doctor’s sonic screwdriver briefly banishes the mist allowing the parents to find their children but it is not powerful enough to banish it completely. The Doctor disappears in the TARDIS and returns moments later with it all decked out in Christmas lights which makes the mist, and the Krampus disappear. For all its short length, its quite an affecting story. The distraught parents and terrified children are drawn well to emphasise their plight in the few frames they appear. They are all dressed appropriately peasanty/19th century European too. Of course the resolution – a bit of light, is fairly cursory, but as I say, that is par for the course for these strips. What rankles a little more is the fact the Doctor doesn’t really confront the Krampus. It floats in the background and then, when the Christmas-lit TARDIS appears, disappears in the puff of red smoke. The Krampus is an interesting choice of villain. It is a real Christmas legend in Alpine areas – a creature who takes naughty children and eats them – a sort of anti-Santa Claus. It is a creature featured or referenced in some more fantasy-based TV series such as Supernatural and Grimm. As such it seems a little too ‘magical’ for Doctor Who (and there isn’t any ‘alien/scientific’ explanation really given by the Doctor) although it does fit with the ‘fairytale’ motif so beloved of Steven Moffat and the era of Doctor Who this story is set in. It is a shame it is so passive in the story, loitering in the background, never interacting with any of the characters and, as I say, disappearing at the end without so much as a by your leave. The Doctor and Amy are as well-characterised as they can be in such a short space. Amy is full of concern for the distraught parents and the Doctor wears another in his collection of silly hats (this time a Christmassy ‘jingle bell’ affair). As always, the DWA strip provides a fun snack but little more.